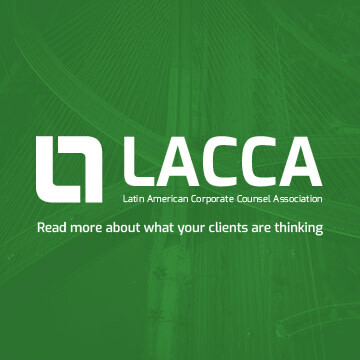 Latin Lawyer and the Latin American Corporate Counsel Association (LACCA) are the definitive sources of news and analysis for private practitioners and in-house counsel in Latin America’s business legal market. Latin Lawyer has been providing comprehensive coverage of the region’s legal market for almost two decades. Besides keeping readers up-to-date with a daily news email briefing, Latin Lawyer content is available online and through a magazine published 4 times a year. Our daily news briefing is a must-have source of information for lawyers practising in the region. Latin Lawyer's independent team of journalists provides news and in-depth analysis of law firm community news and deals and cases, as well as legal and policy developments across the region. Latin Lawyer is a first port of call for law firm leaders in the region seeking information on management strategy. Thanks to over 10 years of independent research, we produce un-rivalled analysis and surveys of Latin American law firm management and financials. Alongside this, we produce regular league tables, country profiles, interviews and roundtable discussions. Sign up to the daily news and find out more about subscribing to Latin Lawyer. For more information about upcoming research and coverage, you may like to visit take a look at our editorial calendar. LACCA brings together leading in-house counsel working in the region, affording them the opportunity to interact, share ideas and best practice, and network with peers across Latin America. LACCA provides a weekly news briefing service on a full range of issues affecting in-house legal teams. Our dedicated and experienced team of journalists in the field seeks to equip in-house counsel with the tools they need to run a successful legal department. By shining a light on in-house counsel needs, LACCA content also provides content that can help private practitioners shape their service offer to provide the best value to clients. Membership of the association is free for lawyers working in-house and directly employed at a company on a full-time basis, who do not offer their services for a fee. Private practitioners can read LACCA content through the Latin Lawyer premium subscription. Sign up to the weekly news. Learn more about membership to LACCA, or how to subscribe. 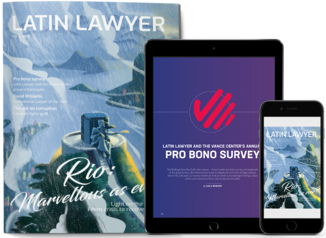 The Latin Lawyer editorial team provides intensive practice area research in the form of the Latin Lawyer 250: Latin America's leading guide to business law firms. This guide provides an annual review of the legal marketplace across multiple Latin American jurisdictions, complete with analysis of the Latin American practices of international law firms. We also publish annually the Latin Lawyer Elite, a group of 40 leading firms in the region, not only for the work they do, but also for the way in which they are led and managed. The leaders of these firms work with us on high-level research and meetings to discuss critical issues for the profession. LACCA provides detailed analysis of the best law firms in the region through LACCA Approved - Latin America's leading private practitioners as voted for by the region's leading corporate counsel. Free-to-view, Latin Lawyer Reference provides answers to key legal and regulatory questions in Latin America on major practice areas. Leading practitioners and local counsel provide insight in over twenty practice areas, including Project Finance, Mergers & Acquisitions, Intellectual Property, Litigation, Arbitration and Bank Financing. The interactive format allows for quick-and-easy comparisons across jurisdictions. Latin Lawyer and LACCA’s Guides provide in-depth analysis of Latin America’s main industries from leading practitioners. They are an essential tool for in-house legal teams and their external legal advisors, created by bringing together pre-eminent authors to provide the latest and best approaches to the myriad issues confronted in the region’s most important areas of business. Latin Lawyer holds sector or practice area-specific live events across the region debating the latest hot topics. Speakers from throughout the region and beyond discuss and present their ideas in front of a live audience generating ground-breaking content. Take a look at our upcoming events. LACCA holds annual regional and local meetings, gathering in-house counsel of leading companies for a high-level discussion of the key issues in running a legal department in Latin America today. Take a look at our upcoming events. Latin Lawyer and LACCA hold annual awards ceremonies attended by the region’s leading practitioners. The events celebrate the achievements of lawyers working on the region’s most interesting transactions and cases, as well as recognising individual practitioners from law firms and in-house legal teams. Latin Lawyer and LACCA are part of Law Business Research Limited, an independent, multi award-winning publisher of research, data and analysis on international business law and international legal markets.